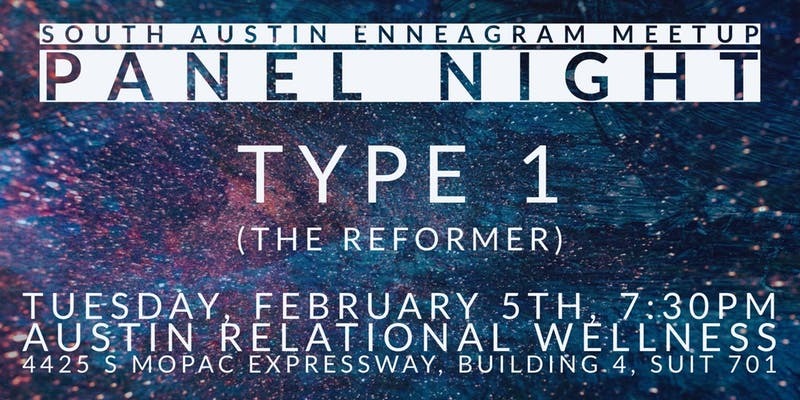 Join us at the South Austin Enneagram Meetup for our first ever Panel Series! Starting in February, we’ll spend the first Tuesday of each month exploring a different type through the Narrative Enneagram’s Panel method. We’ll have 3 or more people who all self identify as one type sharing what it’s like to be their type. There’s no better way to gain a deep and nuanced understanding of a Type than to see them demonstrated through the panel method. This is the last Embodied Enneagram workshop in Austin for 2019, you don’t want to miss out! The Bhagavad Gita describes yoga as “The journey of the self, through the self, to the self.” If you’re setting out on this journey, you need a map. The Enneagram (also known as the Enneagram of Personalities) is more than just another personality typing system, it serves as a map of your inner world and a guide to your truest self. The Enneagram of Personalities is more than just another personality typing system; it serves as a map of your inner landscape and a guide to your truest self. It is a psycho-spiritual personal development tool, like the owners manual for your personality. The Enneagram marks out 9 basic styles, an expression that influenced Dante’s The Divine Comedy and Homer’s Odyssey. Each personality archetype is determined by its patterned and habitual over or under use of each of the 3 centers of a human: intellectual, emotional, and instinctual or moving center. This workshop will give you a deeper understanding of yourself and those around you. You’ll discover your Enneagram type and learn the basics of how you can use your yoga practice to transform your life. Yogi’s Guide to the Enneagram Part 2 will be offered for anyone who’s taken Part 1 and wants to go deeper into understanding the Enneagram through the Yogic lens. Part 2 will include movement, breathing and meditation targeted to your type. You’ll learn how the Enneagram relates to the modern Chakra system and you’ll leave with a practice tailored to your personality designed to help you regain balance and grow from a place of grounded presence. The Enneagram (also known as the Enneagram of Personalities) is more than just another personality typing system, it serves as a map of your inner world and a guide to your truest self. The work shop takes you through discovering your type by exploring the ways it shows up in the way you think, feel, and take action in your life. Then we learn about the other types as their taught, getting a glimpse of how other people see the world. Anyone who has an understanding of the enneagram and wants a more effective way of working with their personality. Anyone who wishes to deepen their practice and have a firmer understanding of what balance and health looks like uniquely for them. Anyone who wants to improve their life, relationships, and grow as a person! Learn how to effectively use the Enneagram in your own life and with your clients to build stronger therapeutic relationships, increase positive outcomes, and better equip clients to engage in their own healing. Join Abi Robins Yoga for Yogi’s Guide to the Enneagram Pt. 1 on Saturday January 12th from 12pm-2:30. This workshop will give you a deeper understanding of yourself and those around you, helping you set a course toward personal growth and ever-expanding compassion. The Enneagram is one of the hottest buzzwords in the wellness professions, but what is it? And how can you implement it in your own life and with clients? This 1.5 hour presentation will discuss what the Enneagram is, where it comes from, and how it’s used, as well as practical applications for working with clients. Wherever you are in your journey, we want you to come out and share what life is like for you as your type. The Austin Enneagram Meetups are coming together for a night of food and fun in our first ever community panel night! Panels will start at 4pm as we explore the three triads (head, heart, and body). There will be light snacks provided during the panels and a potluck after! Please purchase your ticket through this link as soon as possible so we know how many people to set up for, and don’t forget to bring a wonderful dish to share! Here are directions to get to the space: park in the front parking lot; come in the main entrance; go through the building, through the courtyard to the building at the back. Once inside, our room is to your left! A few of us will be out in front helping people find the space up until 3:59pm and the panels will start promptly at 4, so don’t be late! Join Abi Robins of Conscious Enneagram for Yogi’s Guide to the Enneagram, on Sunday, July 22nd at 1pm at @yogaeight. This workshop will give you a deeper understanding of yourself and those around you, helping you set a course toward personal growth and ever-expanding compassion. The workshop takes you through discovering your type by exploring the ways it shows up in the way you think, feel, and take action in your life. Then we learn about the other types as their taught, getting a glimpse of how other people see the world. Then we talk about how our yoga practice can be specifically tailored to help us work with our personality and live more from our true self. We’ll have a short practice at the beginning and end to help us “feel” the information and experience what it’s like to move, breathe, and meditate with this newfound insight. Anyone who has an understanding of the enneagram and wants a more effective way of working on their personality.